Every rescued dog has stories to tell. This is Junior, my rescued golden retriever’s, favorite. Junior, my therapy dog partner, started his golden retriever days alone, locked most of his first year of life in a crate . At eleven months old, he was sent to a shelter. He was rejected for adoption three times before my husband George and I, two recently retired baby boomers, met him . In the middle of a hot Texas summer , George and I were sad. It was the kind of sadness that aches in your bones and is largely unspoken to any one but each other because, after all, the loss was “just a dog”. Max , our golden retriever, had died. Max shared 15 years of our joy, sadness, losses , and our busy lives. We were still recovering from losing him to cancer. He was gone , leaving a hole in our hearts. It happened just as the three of us moved into the new world of retirement. Now it was just George and I , trying to figure out what was next. The house felt hollow and empty. People handle grief in many ways. George, my husband of 40 years, vowed never to have a dog again. “Never again. It hurts too much. No more dogs,” he said. But I knew I needed another dog. And soon. I was a volunteer with our local golden retriever rescue and it was hard to see homeless Goldens almost daily. “Let’s foster a golden, “I told George. “Just to have a dog in the house again,” I urged. “No, that dog will never leave,”George sighed. To this day, I don’t know if that sigh was a warning or a hope. 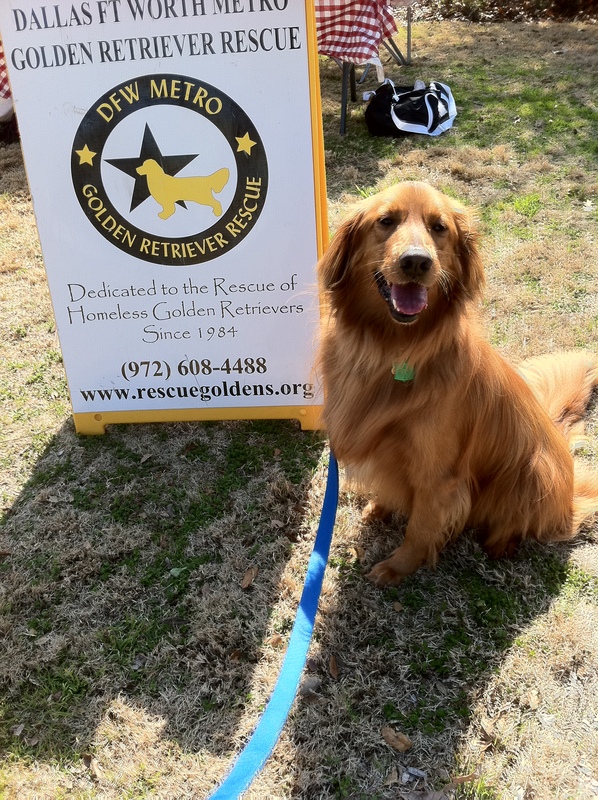 Two days later, on a sweltering Texas Saturday , I saw an eleven month old, red, golden retriever arrive when I volunteered at our golden retriever rescue adoption day. I watched the skinny red dog jump up, sloppy kiss a prospective adopter, and almost knock her down. He barked every time someone tried to speak, and he lunged so hard on the leash he almost knocked me over when I tried to untangle the flustered adopter from the leash which had wrapped around both her feet and the feet of the red retriever. The surprised , impeccably dressed woman adjusted her crisp white blouse and looked down with disdain at the red dynamo. I saw little beads of perspiration begin to form and drip her cake makeup down her face. Her perfectly coiffed, big Texas hair was beginning to wilt in the Texas heat and now looked flat against her head. She quickly turned her attention to a large, docile, mature, blonde, female golden . In less than an hour, the two blondes were driving off together in their air conditioned Lexus. The rejected red wild-child was not discouraged . He promptly put both paws on my shoulder, licked the pouring sweat off my face, looked me directly in the eyes , and flashed the famous golden retriever grin. “Ok I will foster him until he finds a home,” I heard the words coming out of my mouth and wondered who that crazy woman was that I heard speaking. The foster coordinator looked at both of us, just grinned and handed me the leash. I pushed my new charge’s bouncing red, Golden Retriever rear end towards my car and loaded him into my VW beetle. As the sweat poured down my back and face, we both landed securely in the back seat and smiled at each other. I worked on a plan to get us into the front seat and how I was going to introduce our new houseguest to George when we got home. After one week, George and I knew the wild, charming foster golden would be ours and we adopted him. He was so unlike our docile sweet Max. I thought this young, energetic and clever golden was just what two newly retired boomers needed. We were in search of new purpose and projects in retirement . Here he was. And it wasn’t going to be boring. We all needed work. We all had a lot of life left in us and needed new focus. It looked like the three of us we would figure it out together. The evening of our decision to adopt our new foster dog , George and I went out dinner to celebrate. Our new family member needed a name. When a dog enters rescue , the dog is given a rescue name , and our new addition’s rescue name turned out to be “George”. “Neither one, ” George. #1 replied. “Well I guess he could be George Junior,” I joked. And from that day forward he was Junior. And so our work together to find ourselves in our new phases of life and our second acts began. Junior has been at the other end of my leash and in my heart ever since. We are partners and friends and are helping each other find the magic still left in each of us and learning how to work and to love as we teach and learn from each other. And I was right. It is never boring.